First impressions are extremely important. Statistics show that humans naturally form a solid opinion of someone else within seven seconds of meeting them. That means that you have less than ten seconds to convince another person how awesome you are before they have a chance to decide otherwise. The high importance of first impressions is a big reason why job interviews are so stressful. It is more than likely that the initial impression you make on the person interviewing you at a company will make or break your chances of having the opportunity for a future with that company. Considering how quickly humans form their first impressions of others, it’s important to dress for success at any job interview. The way you carry yourself, your charisma, and the skills and experience you bring with you to your interview should win you points in the right direction. However, don’t ever underestimate the power of your wardrobe at a job interview. While what’s on the inside should count more than what’s on the outside, what you wear to a job interview automatically impacts your interviewer’s opinion of you for better or for worse. If your outfit screams professionalism and competence, you have a much better chance of getting hired anywhere than if your style choices demonstrate that you don’t really care much about the position. So how do you construct an outfit for a job interview that communicates your intended message to your potential future boss? Interviewing for a waitressing job at a beachside restaurant is notably different than interviewing for a management position at a big-city corporation. It is likely that the outfits you wear to these two job interviews should be different, too. However, how you change your interview outfit for different interviews should depend more on the position you’re applying for and the nature of the interview rather than the company itself. Don’t think that the casual nature of an establishment itself means that you should look casual. If your interview is for any type of management position, dress as professionally as possible. Interviews for more casual positions, like retail work, usually warrant business casual rather than business professional wear. Group interviews or interviews within the modern tech industry also generally call for more casual attire that still looks professional. It is always best to err on the side of caution when it comes to professionalism in your attire. It’s better to look too professional than too casual. If you’re unsure of the professionalism requirements of an interview, do your research. See if you can find out more information on the expectations of that specific company or similar companies within the same industry. You might think that it doesn’t matter what color your clothes are as long as they’re the right style for a professional interview. While the color of your blazer shouldn’t make or break the success of your interview, there are some colors that are better to wear to an interview than others. You should avoid wearing red. In terms of first impressions, this power color gives off a defiant or even rebellious vibe. Bright, “fun” colors are also not good choices for initial interviews; they tend to scream “unprofessional” right from the start. Navy, black, and white are all safe choices when it comes to interview colors. Try not to make your whole look too monochrome, however, especially if you’re wearing multiple black pieces. A look that’s all one color often comes off as excessively intense. Mix up the colors and textures you wear to appear more balanced and approachable. Pair a sleek navy blazer with a lacy white blouse, for example. Modesty is very important when it comes to a job interview. First of all, conservative wear is widely considered to be more professional than revealing clothing. Also, you want your personality, not your body, to steal the show at your interview. Be careful with blazers. A blazer is a popular interview wear choice for a reason. However, their natural sloping cut automatically creates a low neckline. Make sure that you pair any low-cut blazer with a high-necked blouse or a button-up. You want to look professional when you go into an interview, but you also want to appear approachable. No one wants to hire an employee who seems or looks like a robot instead of a real-life human. This does not mean that you should wear jeans and a T-shirt to your interview. Just make sure you feel comfortable and genuine in the outfit you choose. This will help you look and feel approachable as well as professional. Arguably the most important part of putting together an outfit for an interview is making sure that you look put together. Don’t pay too much attention to single components of your outfit. Instead, make sure that your look as a whole is sleek and goes together flawlessly. 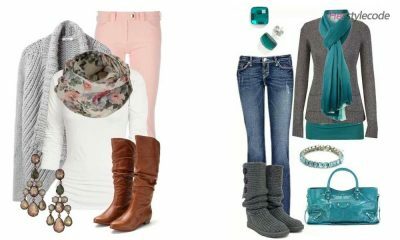 A great way to do this is to incorporate two to three different colors and textures and blend them throughout your look. If you opt for a white blazer with a black shirt, wear white shoes as well. Match your navy pumps to your navy blouse. Shoes are one of the most vital parts of your interview attire. The right (or wrong) shoes can make or break your look as a whole. It’s always a good idea to wear sensible heels if possible. Don’t go for stilettos, but kitten heels, pumps, and wedges add instant style and professionalism to your look. If you don’t feel comfortable in heels, don’t wear them. Instead, opt for simple, close-toed flats that look professional and don’t detract from your look as a whole. It’s not a good idea to try to show your interviewer how unique your style is with your interview attire. Remember that maintaining professionalism should always come first. However, feel free to set yourself apart from the horde of other interviewers in simple ways. A great way to do this is to add a simple accessory that doesn’t take away from the professionalism of your look. Try bangles, a pendant necklace, or an appropriate fashion scarf. Interviews are always scary. Feeling confident in your interview attire can help with your nerves. Put professionalism first and let your outfit and your personality work their magic together to get you hired.